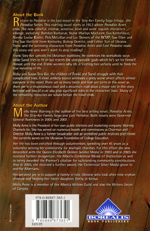 About the Book Molly Anne Warring is the author of the best selling novel, Paradise Acres; The Stry-Ker Family Saga and Lost Paradise. Both novels were Governor General Nominees in 2005 and 2007. Return to Paradise is the last novel in the Stry-Ker Family Saga trilogy...the Paradise Series. This riveting novel starts in 1953 where Paradise Acres ends. The new colorful, intense, sensitive, kind and somewhat roguish characters emerge, including: Bohdan Barbaruk; Nurse Marilyn MacLean; Gus Kartofilous; Norma Louise Kaditz; Rob McLellan and Luc Demers of the RCMP; Sue Ellen and Ellie Sue Hatfield from Kentucky; Bishop Demitri; and father Yuri of Ukraine. These and the surviving characters from Paradise Acres and Lost Paradise make this story one you won´t want to stop reading! Franki Stry-Ker upholds his Ukrainian traditions. He continues his workaholic ways while Sandi tries to fit in but resents the unreasonable goals which he´s set for himself. Almost until the end, Franki wonders why life is treating him unfairly until he finds the true meaning of life. Nicky and Susan Stry-Ker, the children of Franki and Sandi, struggle with their complicated lives. A most unlikely source witnesses a grisly scene which affects almost everyone in the novel. There are as many twists and hair-pin turns in this novel as there are in a mountainous road and a mountain road plays a major role in this story. Betrayal and loss of trust also play significant roles in the character´s lives. Many of the remaining mysteries are solved before the novel ends.